On Friday 4th February, ExTalks ran an event in conjunction with the Archaeology Society and the Classics Society, attended by students from across the university. The topic of the event? ‘No Maps, No Borders: An Evening with Giocherenda’. 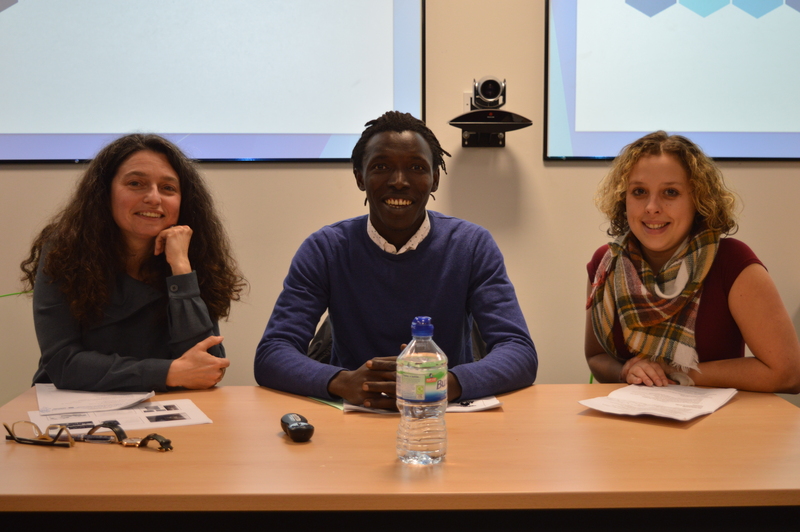 Mustapha Conteh of Giocherenda, Elena Isayev of the Exeter University Classics Faculty, and Dominique Luton a 3rdYear Student all provided talks on the role of movement, borders, and space in an evening designed to highlight how themes of the classical world can prove extremely pertinent in the modern day, simultaneously getting attendees to rethink their understanding of the ancient world. The event was initiated by Professor Isayev, who examined ideas of mobility and place in the ancient world, contextualising her findings with regards to modern experiences that members of the general audience could better understand. For many, the presentation proved to be the first time they truly considered notions of mobility in the ancient world; it served to challenge misconceptions that the modern world of nation-states (with well-controlled borders) had always been. Following this, Mustapha Conteh spoke as the representative of the eponymous Giocherenda refugee art collective based in Palermo. Giocherenda he explained, is an art collective formed by refugees in order to help them deal with their experiences of travel, as well as providing a medium through which they can share their story with the citizens they come to live alongside. They create games in an effort to get people to think of journeys in a different manner and to help people to better understand the stories of those who’ve been displaced. Lastly was Dominique Luton, her presentation focused on another event that had been run with Mustapha’s assistance – an educational workshop at a local secondary school. Here, the various year seven classes were able to engage with the storytelling games used by Giocherenda and were encouraged through various activities to try and engage with journey stories in both ancient and modern contexts. To raise the profile of Giocherenda abroad, the platform provided served to highlight the important work undertaken by the members of Giocherenda with an audience that normally would never have heard of them. This in turn helped students not only engage with the immediate stories raised by Mustapha as a representative of Giocherenda, but the wider context of journey stories throughout history and the current refugee crisis taking place across Europe. To raise student awareness of the importance and implications of journey stories, and how they can serve to highlight fundamental flaws with our pre-conceived assumptions of place and space. The opening and concluding talks of the event run by Elena and Dominque both served to highlight the many misconceptions held by the audience about journeys both in the ancient world, and today and encouraged those present to rethink their perspectives. Many of those who attended the event were keen to carry on the discussions afterwards, and so they joined the speakers and organisers for after drinks where the themes of the various talks were discussed in great detail, and with interesting new perspectives being provided by all sides.